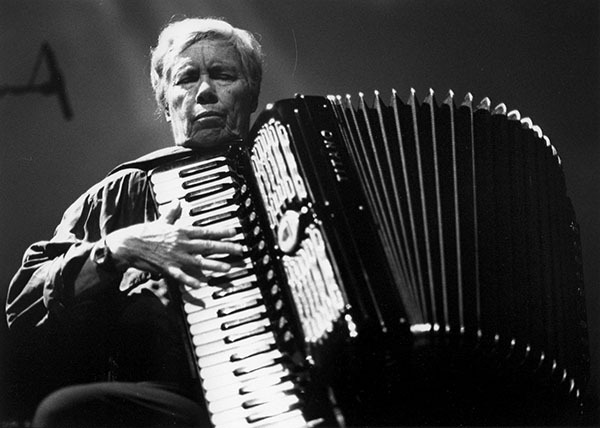 Pauline Oliveros is a composer, accordion player, educator and karate black belt. Fascination with the sound world got me started. I was always listening to the sounds around me in 1930s Houston TX. There were wondrous arrays of insect, frog and bird sounds everywhere. I listened to the chickens sing on hot summer afternoons on our chicken farm, I listened to the chugging motor sounds of our car and the way that my parents voices were modulated while I lay in the back seat listening. Oh - and the piano lessons in the morning and afternoons. The recitals and concerts and eventually my music lessons. There was always sound and music to attract my attention. By the time I was 16 I knew and announced that I wanted to be a composer. The piece I may be working on usually tells me it is time to stop. There is a kind of ending energy that comes about. I go with that and it is usually right. I use 50/50 chance in algorithms in my Expanded Instrument System to manage more than 40 delay times. These algorithms are applied to delay times, modulations of delayed signals, modes of modulations, switching time, and spatialization values. I am very comfortable with random processes. I am working on Smart Hands Free Controller for the iPAD and other applications. I want my controllers to make the kinds of decisions that I would make during performance without having to use faders or pedals. Listening inspires me as it has since earliest childhood. Sharing visionary ideas with others in a way that inspires them to completely understand what I am talking about.